It's the perfect time to buy the machine you've been waiting for! Not only are all our machines on sale, you will get an instant savings bonus on top of the sale price. 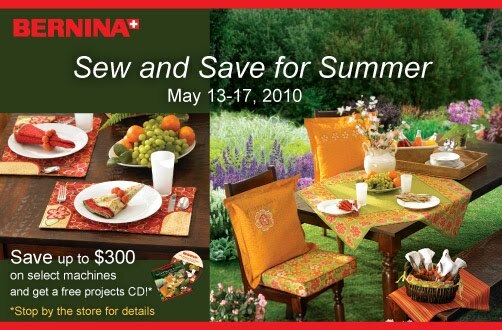 Come in for a demo May 13-17 and see why we all sew on a Bernina. 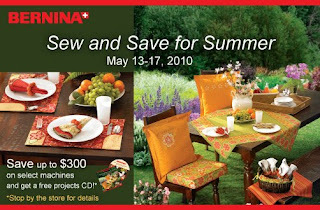 If you have been thinking of the new 820 or 830 machines, you can still get the quilt frame or cabinet at an incredible savings until the end of May. Summer class sign up is in full swing- sign up for your favorites now! We will be blogging our trip to International Quilt Market in Minneapolis next week. Can't wait to share with you all our fabulous finds! See you soon!